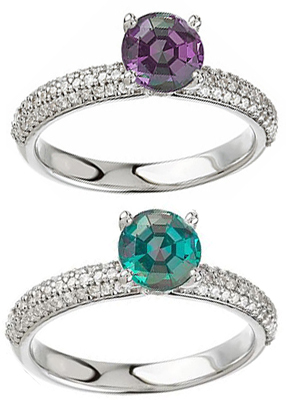 We are very proud of our selection of alexandrite rings. Fashion rings as well as engagement rings and alexandrite wedding bands. 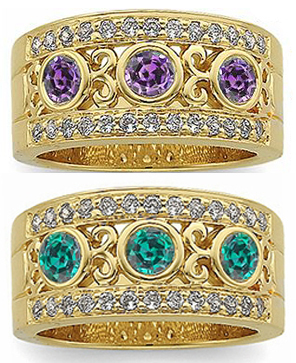 Alexandrite use in engagement rings is trending up, up, up! Savy engagement ring buyers are seeing the that value, rarity and uniqueness of a genuine Alexandrite engagement ring far outshines the hyped, overvalued diamond engagement rings. 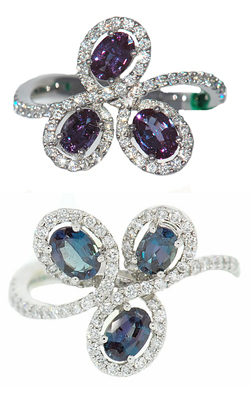 For a moment, let�s examine the use of alexandrite in engagement rings. Some cultures call them betrothal rings, some call them engagement rings but no matter what you call them, they have been around for centuries. It is believed that in �modern� Western cultures the wealthy started giving engagement rings sometime after Austria�s Archduke Maximilian I gave his beloved Mary of Burgundy an engagement present of a diamond ring in 1477. Now fast forward to the 20th century and the availability of diamonds for use in engagement rings for those of every financial status. First it was white diamond solitaires. For a period in the 1980�s, the trend was a blue sapphire center gemstone, surrounded by white diamonds similar to Princess Diana�s engagement ring. Then in the first 10 years of the 21st century, the trend was to mix pink or yellow diamond solitaires with white diamond side stones. Some chose to combine black and white diamonds in their engagement rings. Because of the changing trends, there is no right or wrong when it comes to an engagement ring. It should be all about what works for the couple and more importantly, what works for the bride. Many brides are taking the �Princess Diana� sapphire and diamond engagement ring to the next step. They are choosing to use alexandrite as their engagement ring gemstone. Alexandrite with or without diamond accents make exceptional engagement (or wedding) rings.Why Use an Alexandrite for An Engagement Ring?